This Grateful Dead Tie Dye t-shirt is printed with the 'Steal Your Feathers' artwork on the front. A variation of the band's signature skull and lightning bolt logo is printed on the front, and a compass design on the back. 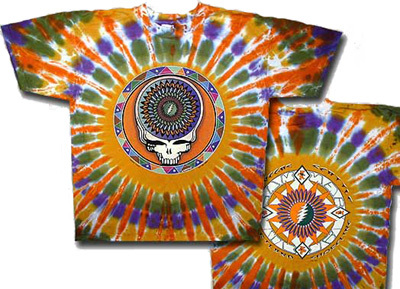 The tie dye design forms a circular pattern in shades of green, yellow and earthy tones, in a southwest style. The Grateful Dead were an American rock band formed in 1965 in the San Francisco Bay Area. 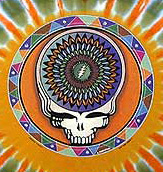 The band was known for its unique and eclectic style, which combined elements of rock, folk, bluegrass, blues, reggae, country, jazz, psychedelia, and space rock. Show your great taste in music with this unique shirt.